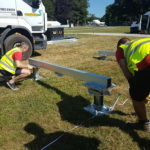 The team at Red Box Engineering have done an amazing job over the last few months creating the Goodwood Festival of Speed stand completely from scratch. 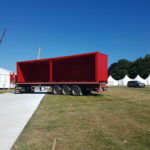 We decided to give ourselves a challenge this year and create an exhibition stand out of 4 40ft containers! The team came together to create, what we think, is the ultimate stand! We stacked the containers and placed them facing each other to create the basis for the stand. The team then got to work cutting the sides away to create a big open space in the middle. A bar was manufactured using the spare metal from the container sides. The walls were then clad, this makes it easier for them to be painted. 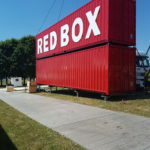 Red Box International then came in to fit all of the electrics we needed for the event. 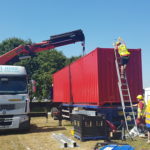 One of the top containers was being used as storage for the duration of the show, so the team also fitted a door and created a metal staircase with railings in order to be able to access the storage room. The stairs were made from Galvanised Steel. 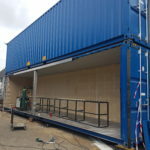 Once these tasks we complete on site at our workshop in Totton, Southampton, the containers were ready to be painted. 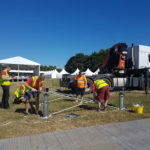 From there, they went straight to site at the Goodwood Estate. The containers were delivered on arctic lorries, one by one. They were put into place using a crane. 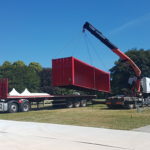 The team also needed to make sure that the base was level before the containers were laid down. Therefore, metal beams were set to ensure that there was a level platform for them to sit on. The team were now able to place the Aluminium letters onto the side of the containers. These slotted into place using bespoke brackets screwed to the container. Hooks were fitted to the letters, making them easily removable. The lettering was painted white and created a brilliant contrast to the red containers. After one day the containers were in place with the lettering up. It was time to start laying the flooring and bringing in the stock and displays! The ramp and stairs for access to the stand were also put in place and the custom made roof, skirting and banners were put up. The team needed to work on top of the containers quite a bit throughout the build, so they underwent their Working at Heights training. The final day of preparation came. 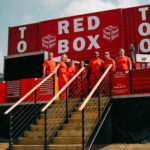 It was down to the rest of the Red Box team to ensure that everything was okay for the big day. 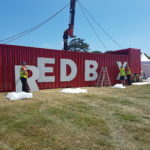 The Red Box team have definitely made a mark at Goodwood this year. 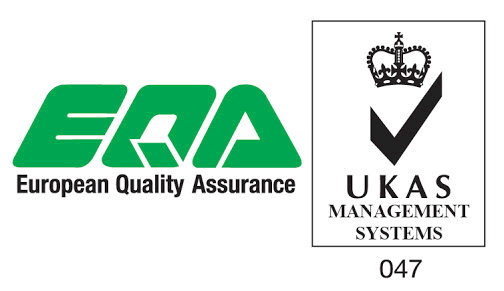 We are looking forward to planning for next year. 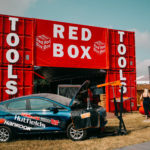 The Red Box Engineering team used the Water Jet, Welding Sets and Folder in order to create the lettering and staircase for the stand.